Twenty years of internal conflicts, Taliban regime and 5 years of drought resulted in a breakdown of the social infrastructure and forced 5 million refugees to flee their homes. 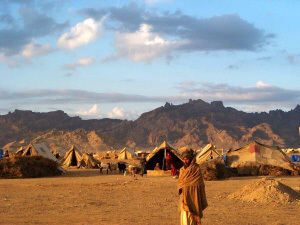 JTS began its work in Afghanistan in 2002 with emergency relief response to the Kuchi nomads in Kandahar province. In Kabul vicinity, village development work was carried out and in Kandahar, the emergency response work phased into an education program for the children of nomad IDPs, setting up tent schools and training teachers. In Bamyan, winterization relief items were provided as an emergency appeal program in Waras district as well as stationeries for the students in village classroom schools. 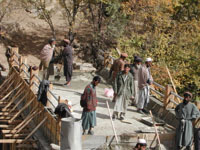 In addition, a women’s centre was built in Bamyan centre to provide opportunities for women that was denied for so long. 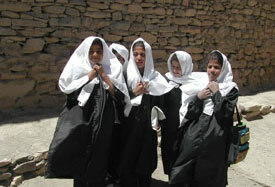 Education was never a high priority in Afghanistan, with as much as 14% illiteracy rate for adult females. Girls were banned from attending schools and with many females teachers unable to teach during the Taliban periods, the entire country was facing a crisis of untaught generation of children. JTS has responded to the education crisis by providing tent schools to the children of IDP Kuchis in Panjwayi and providing school uniforms to girl students and stationenries to rural village schools. The living standard of village is heavily affected by its inaccessbility. Many villagers in such circumstances possessed the will to improve their situation but without the means to carryout their aspirations. In order to address these concerns, the community labour work was carried out to make bridges and road repairs. In the spirit of village participation, the villagers contributed their labour while JTS provided the materials and the cost for the skill labours.